Local NHS Trust, Southern Health is linking with Sparsholt College and Help for Heroes to design and create two new gardens for Parklands, its specialist mental health unit in Basingstoke. The horticulture team from Sparsholt College (and University Centre Sparsholt) worked with veteran volunteers who have received support from the military charity Help for Heroes last year to win a gold medal at the RHS Chelsea Flower Show 2018 – and both organisations are delighted to be coming together again to support their local NHS. Parklands is home to a general inpatient mental health ward as well as a specialist ward for serving MoD personnel – treating around 85 people each year from the armed forces with conditions such as post-traumatic stress disorder, adjustment disorder, bi-polar and schizophrenia. To kick-start the project, five students on Sparsholt College’s Garden Design Diploma, under the guidance of their senior lecturer and horticultural expert Chris Bird, have designed the two garden concepts, which will gradually be executed by veterans supported by Help for Heroes and MoD patients in the coming months – ready for a grand opening in the summer. 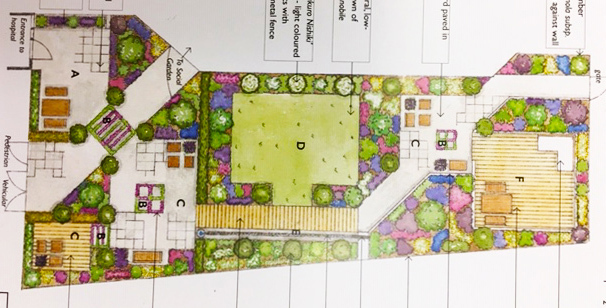 Chris Bird commented: “Our students are relishing the challenges of working on this live project, designing two very different gardens for the benefit of people who are often at their lowest ebb and in need of positive inspiration from nature. The sensory garden is designed to be a therapeutic space with both stimulating and reflective areas, including familiar scents of herbs supported by the movement of ornamental grasses with a structure of shrubs, providing interest all year round. You can follow the progress of the gardens from this current winter planning phase, through to spring planting and the grand summer opening via a monthly blog which will appear on Southern Health’s website: www.southernhealth.nhs.uk/news as well Sparsholt College: www.sparsholt.ac.uk/news and Help for Heroes: www.helpforheroes.com. The project is being undertaken by volunteers and relies on fundraising, so if you would like to support the project, please donate via the Trust’s charity ‘brighterway’ on JustGiving here: www.justgiving.com/fundraising/brighterway-parklandgardens or the collection boxes which will be placed in Parklands’ reception. To find out more about how Help for Heroes uses gardening as a recovery activity for wounded, injured and sick service personnel and veterans, please visit www.helpforheroes.org.uk.